Authors, leaders, novelists, editors, students, pastors, development professionals, songwriters – those who may write for the Christian market – regularly ask this question. The answer is quite simple. 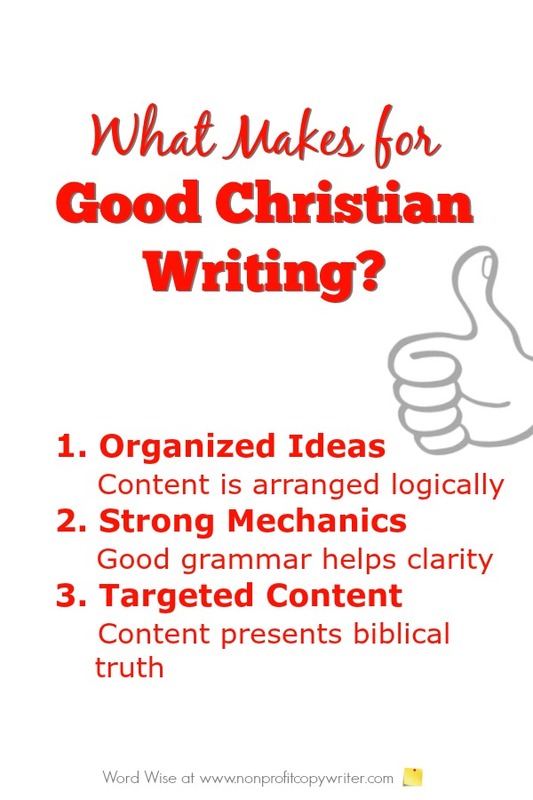 Good Christian writing is typified by the same elements of any good writing – with its distinguishing feature in content. Christian writing communicates biblical truth. And what, pray tell, makes for good writing? A well-written piece – whether it’s a newspaper article, speech, play, web page, blog entry, social media post, letter, email, or novel – is simply a set of ideas which are arranged in a logical order. They move from one to another in a way that makes sense to the reader. Rare is the writer whose ideas arise in linear form. Rearranging ideas, choosing which ones to develop, and deciding how to present them make up a key element of good writing. Words are simply the tools which writers use to present their ideas. Think about a typical toolbox or workshop: a wrench or a circular saw are useful in a building project only when the handyman follows the instructions and uses the tool properly. Likewise, a good writer understands how to use fundamental grammar rules (and when to break them) as a means to an end – the end being the ability to communicate clearly with the most readers possible. Appropriate vocabulary, sentence structure, tense, and voice ensure clarity. The point of writing is to communicate ideas. A writer whose true intent is to communicate makes an effort to understand her reader. By putting herself in the reader’s shoes, the writer is able to determine the mindset, tone, vocabulary, and approach the reader needs. The piece is constructed together accordingly. Is There a Difference Between Christian Writing and the Christian Writer? A Christian writer can write materials that may or may not be faith-focused in nature. The writer is a Christian, but what he writes may or may not communicate biblical truth. Christian writing is typified by the theme of faith woven through its lines. What Can a Sci-Fi Writer Teach Me about the Christian Market?